Is a man of middle years scarred by having been to prison for his role in a phone hacking scandal. 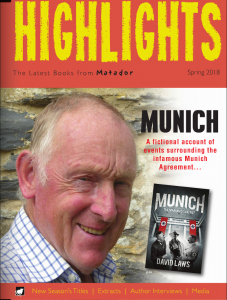 He’s now a reformed man with every intention of settling into a life of comfortable obscurity with Emma’s mother – but is persuaded to repay past loyalty by “riding shotgun” for her daughter on her new mission to Munich. The partnership with Emma quickly becomes combative. Sometimes she’s hostile, sometimes warm. She’s a chameleon and a puzzle he can’t quite unravel. To the public, war seemed very close in 1938. Peace looked to be on a knife-edge. That’s why Chamberlain was ready to give in to Hitler who was making bellicose threats against the Czechs. But was the situation really that bad? It is now clear that 1938 would have been a better time to confront Hitler than doing so a year later when war was declared. Williamson Murray, a history professor from Ohio, has demonstrated the “breathing space” for Britain won by Chamberlain was, in fact, a gift to Hitler. The Nazis needed it more – the Luftwaffe could not attack Britain in 1938 because their planes couldn’t reach. Chamberlain and his supporters who feared German bombing were wrong. And the German Army was in no condition to fight the Czechs over the disputed territory of the Sudetenland. It would have been a fight between three panzer divisions with poor tanks and without big guns against a dug-in enemy with modern weapons sitting behind prepared defences in a mountain region. Perhaps the Germans might have won after lots of hard fighting but would have sustained such casualties they would have been in no condition to attack Poland a year later. As it was, they were handed large numbers of advanced Czech tanks on a plate so that Hitler could launch his blitzkrieg against the West in 1940. Back in ‘38 the German generals had been ready to topple Hitler the moment he launched his attack on Czechoslovakia, but were stymied by Chamberlain’s intervention. The Fuhrer building in Munich is where Britain’s Chamberlain, France’s Daladier and Italy’s Mussolini signed the Munich Agreement in 1938. Built in 1933 and opened four years later, the Fuhrer-bau was part of a group of Nazi buildings put up around the area of the Konigsplatz. Hitler had his office next to the Fuhrer balcony on the first floor where he liked to flaunt himself, just below the Nazi eagle on the top floor. The building survived the war and is now a music school. The big square also survives, as do many other buildings in the city associated with Hitler, but the Temples of Honour, a tomb to dead Nazis, and the main admin building were destroyed. This autumn (Sept 30) is the 79th anniversary of an act of surrender meant to prevent war but which, in fact, made the Second World War more inevitable. The Munich Agreement was signed in Hitler’s room in 1938 at the Fuhrer-bau, today the city’s music school. The building, which survived the war intact despite Allied bombing, gives me the shivers. On the outside there’s a blank space on the upper floor – between the third and fourth windows – where once the German eagle announced this as a Nazi powerhouse. Just below is the Fuhrer’s room.